Happy Birthday Priyanka Chopra! The Desi girl of Bollywood celebrates her 36th birthday today. The Quantico star does not like hitting the gym and is a foodie. Ever wondered how these two contribute to her fitness? Hint; it is the M factor! Happy Birthday Priyanka Chopra: The secret behind Desi girl's excellent curves decoded! She is an actor, a model, a singer, a philanthropist and the dashing face of many global brands, she is Priyanka Chopra! The Desi girl of Bollywood celebrates her 36th birthday today. The small town girl was crowned Miss World in the year 2000 and since then, there has been no looking back for this Diva. From becoming a successful actress to establishing herself as an international star, Priyanka Chopra has reached the epitome of success. But the one thing which has been constant all these years is Priyanka's love for food and perfect curves. Yes, the actress is a self-proclaimed foodie and yet she somehow manages to maintain her perfect curves. It's a wonder how our Diva does that. To begin with, there's one thing you need to know about Priyanka, she is does not like the gym. Then what helps her maintain her gorgeous figure despite being a foodie? Hint; it is the M factor! Yes, while most of must have believed that Piggy Chops gets those perfect curves due to rigorous workouts and a strict dietary regime, our Diva's secret is the M factor. 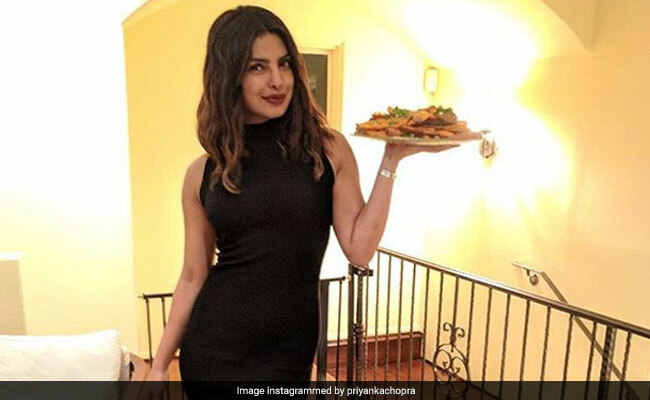 In an interview, Priyanka revealed that she does not spend too much time in the gym and relies on home-cooked food (Ghar Ka Khana). The one thing which helps her keep fit is her great metabolism. The Quantico star credits her toned body to her excellent Indian genes. Surprisingly, the diva only exercises when she feels she is putting on weight. She does not rely on rigorous workout sessions to keep in shape, her metabolism does the task to quite an extent. In an interview, she revealed that as long as her body is in shape without doing anything, why bother. Nevertheless, birthday girl Priyanka follows a set workout regime including four sessions of cardio in a week, half an hour at a time. Besides that, our Diva swears by yoga, it helps her relax and feel energized as well. The Diva is often spotted enjoying a swim as well. This, too, adds on to her fitness quotient. Priyanka is not very fond of weight training sessions and does not spend over an hour in the gym at a time. The opportunity to enjoy every treat without the fear the weight gain, for a foodie Punjabi Kudi, she has the metabolism every woman wishes for. Birthday girl Priyanka is a self-proclaimed foodie. She does not believe in starving and enjoys every treat to the fullest. The one thing she keeps a tab on is oily food and that's it. The Punjabi Kudi loves ghar ka khana, simple vegetable curry, chapatti, rice, soups and salads. But on certain occasions, she is spotted enjoying doughnuts and cheeseburgers. The Quantico star keeps herself hydrated at all times. Besides drinking 10 glasses of water a day, she relies on juices and coconut water for perfect hydration. This keeps her running even on the warm days and does wonders to her skin as well. It is the reason why our Desi girl does not show acne and acne marks. On her cheat day, Priyanka gives her taste buds a treat. Chocolates, truffles, cakes and of course, tandoori treats, that's what our Diva enjoys on weekends. Uncomplicated, effortless and yet so perfect, that's Priyanka Chopra for you!